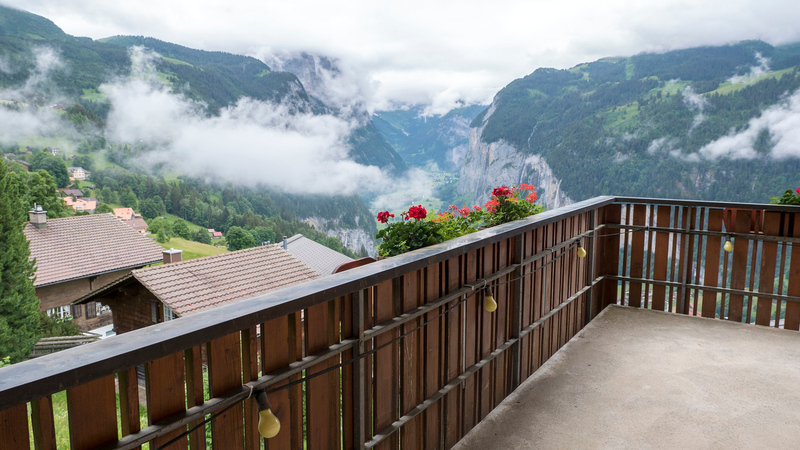 Hotel Bellevue Wengen: You Can’t Beat This View! Prepare yourself for the most breathtaking view! 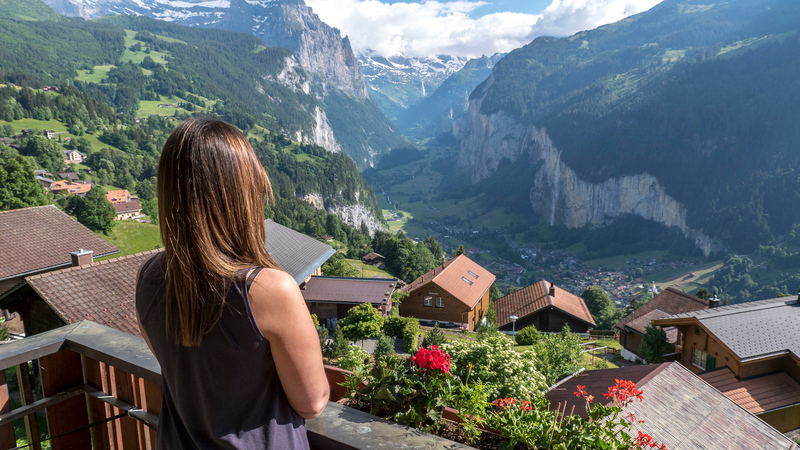 Reaching Wengen is a journey. 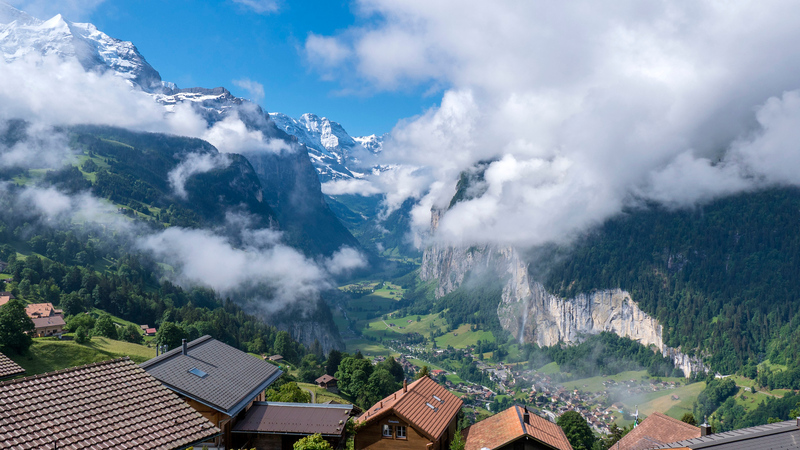 Traveling from Bern, we took the train to Interlaken, then up into the mountains to Lauterbrunnen, and then further up towards Wengen. 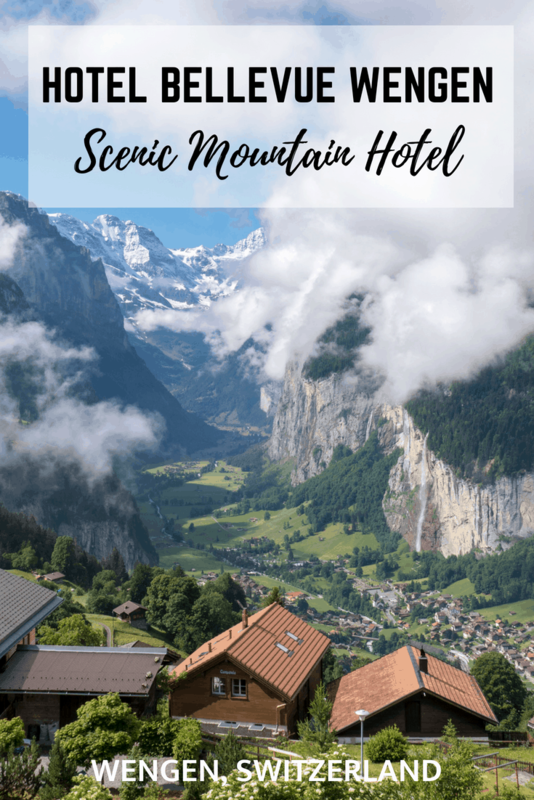 The scenery from this beautiful alpine village is spectacular, but we didn’t realize how stunning until we reached our accommodation, the Hotel Bellevue Wengen. 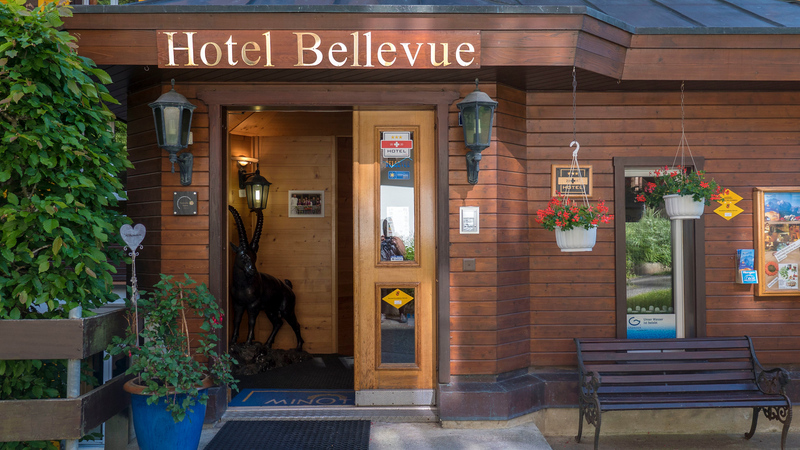 WELCOME TO THE HOTEL BELLEVUE WENGEN! We were warmly greeted upon our arrival by the owner, Judith. 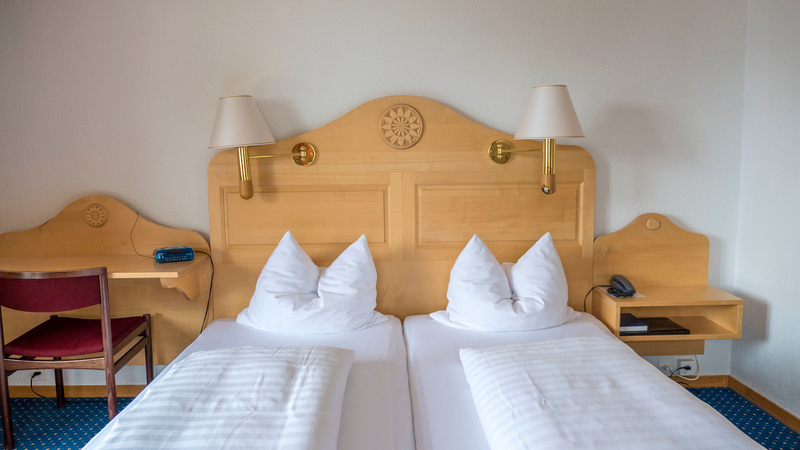 Hotel Bellevue Wengen is a family owned and operated alpine hotel built in 1890; the owners and guests recently celebrated the 125th anniversary of the hotel. There are 34 rooms with picture perfect views, a restaurant, a garden, and a hot tub. From the moment we arrived, we received exceptional hospitality and felt right at home. 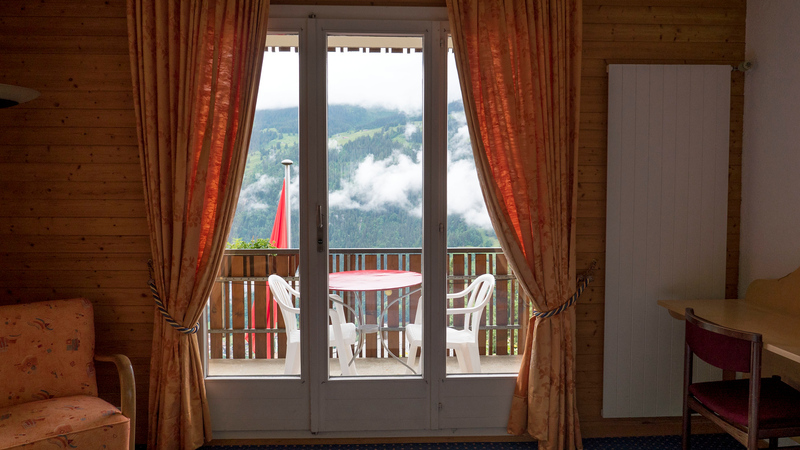 We stayed in a corner room on the second floor with a panoramic view of the mountains and valley. 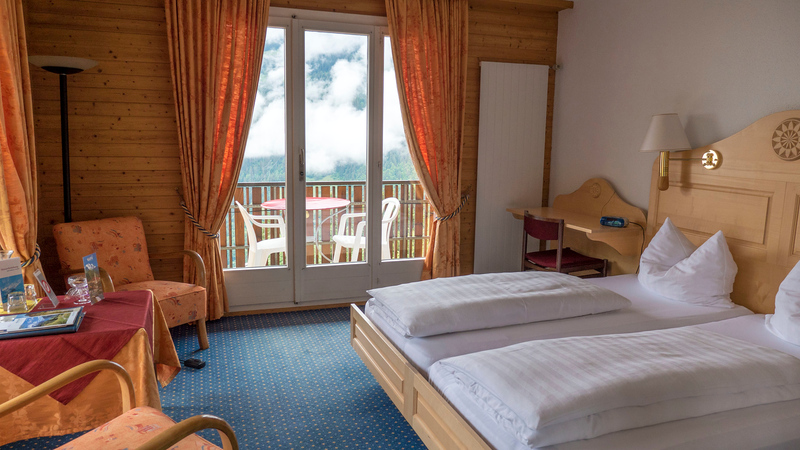 At Hotel Bellevue Wengen, the rooms are relatively no frills in this 3-star hotel. You’ll enjoy a bright room with massive windows, a small seating area, a closet with ample storage space, and a private bathroom. There are no TV sets in the room and after all, who needs to watch TV when you’re in such a spectacular region of the world. Just look out the window and it’s better than any program you could watch. The bed was very comfortable, and I was able to get some blogging work done at the desk beside the bed. 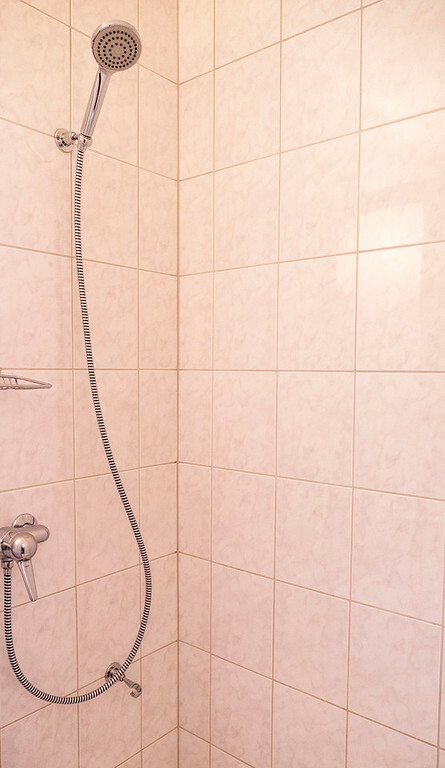 The bathroom was clean and the shower had great water pressure, which is always an important factor for my stay. Overall, the room had a quaint, rustic feel that you might expect from an alpine residence. Let’s talk about the sensational view! 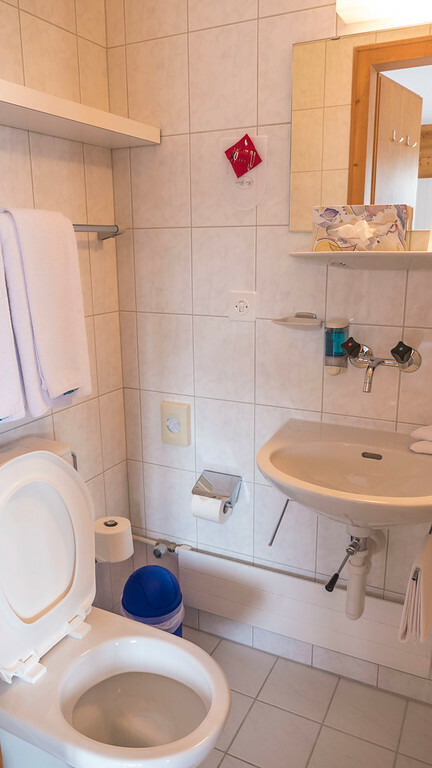 This is hands down, my number one favorite reason for staying at the Hotel Bellevue Wengen. 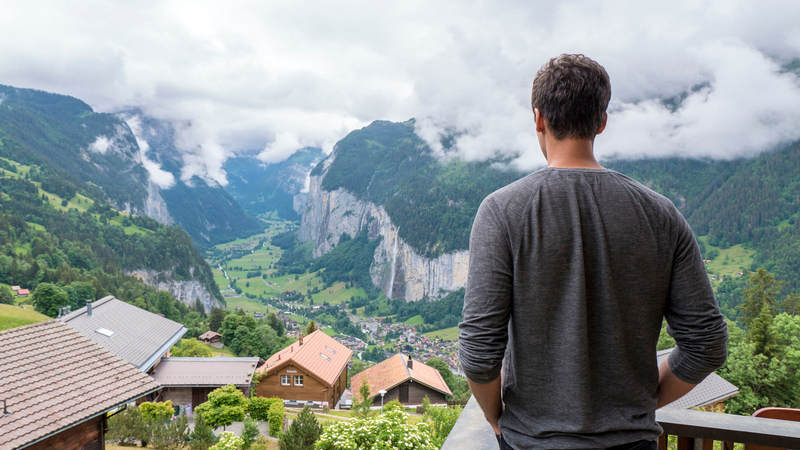 Be sure to book your room so it faces the Lauterbrunnen valley. This way, you’ll be able to enjoy the breathtaking scenery right from your own room. 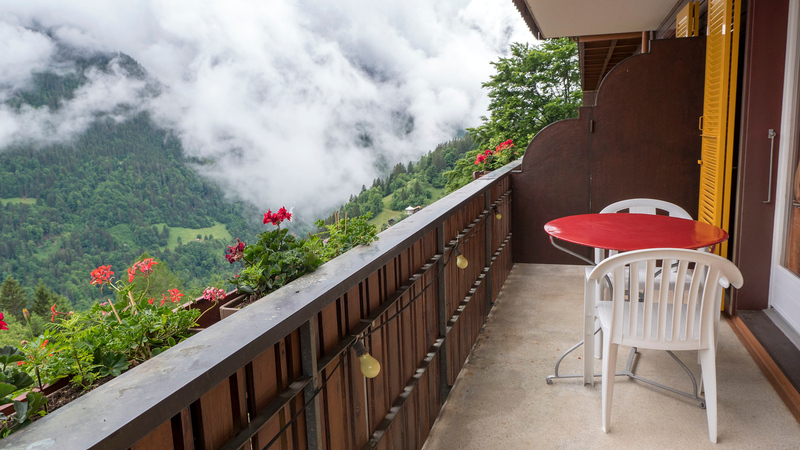 By staying on an upper floor, you’ll savor an unobstructed view of the mountains all around, the rooftops, and the tiny houses in the valley. During our first day, we watched the clouds roll in from the mountains, sweeping across the vista. As our trip progressed, the clouds cleared revealing a majestic panoramic scene. This is one of the most impressive views I’ve ever witnessed in person. 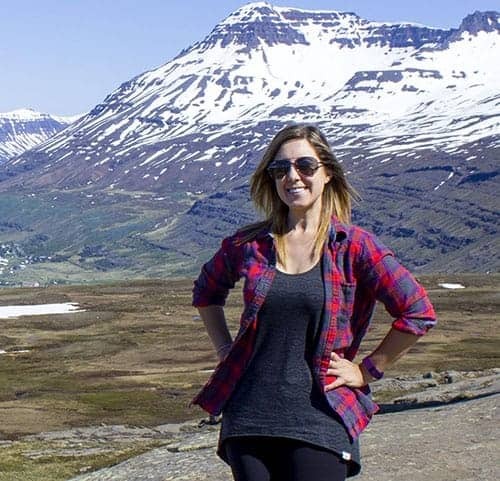 The lush hills, the ice capped mountains, and distant waterfalls left no shortage of features to discover. Later, we went on to explore various areas in more detail up close that we could see from our room. Our spacious balcony wrapped right around our corner room, providing a huge amount of space. There was a table with two chairs, although I didn’t mind standing at the edge of the balcony to marvel at the surroundings. You don’t even have to leave the hotel for meals as there’s a restaurant serving up breakfast, lunch, and dinner. We dined there for dinner on our first evening, and the meal was nothing short of outstanding. Kudos to the chef! Upon our arrival, we chatted to Judith about the fact that Justin and I both follow a vegan diet. That was no problem at all. The chef could prepare a vegan meal for us and we left it as a complete surprise. 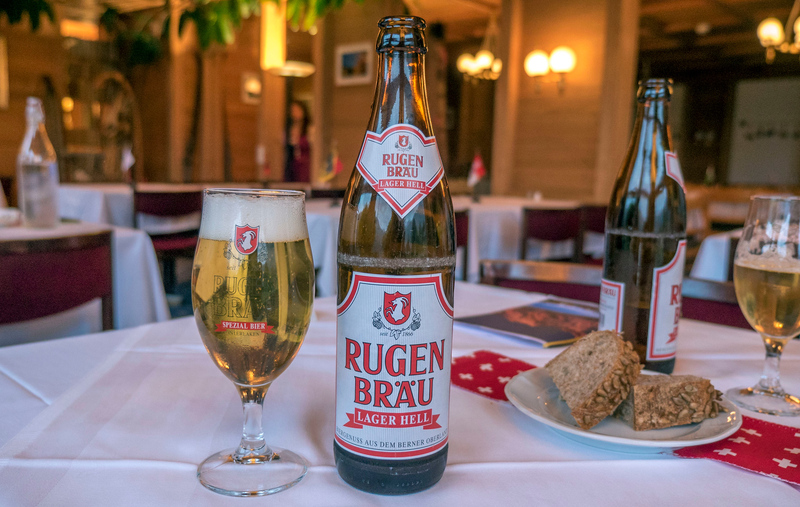 Justin and I ordered locally brewed beer and the restaurant at the Hotel Bellevue Wengen had a salad bar. 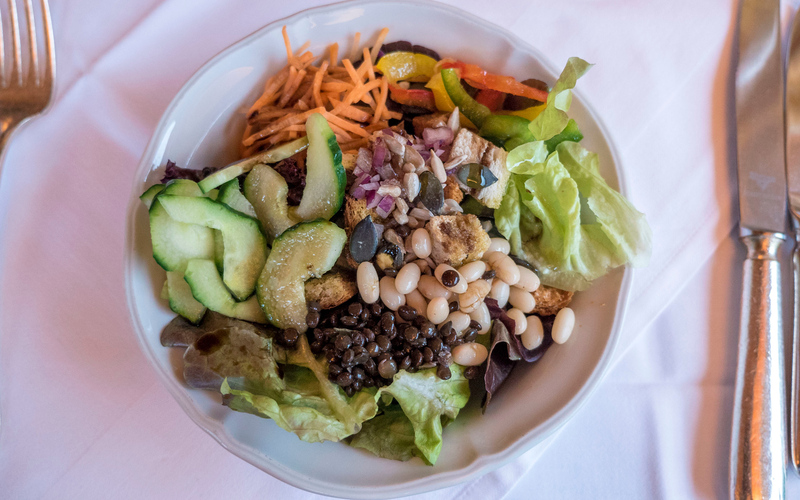 We had the choice to fill our plates up with salad plus every vegetable and bean topping imaginable. However, don’t fill up on salad too much, as we were presented with another four courses of food. 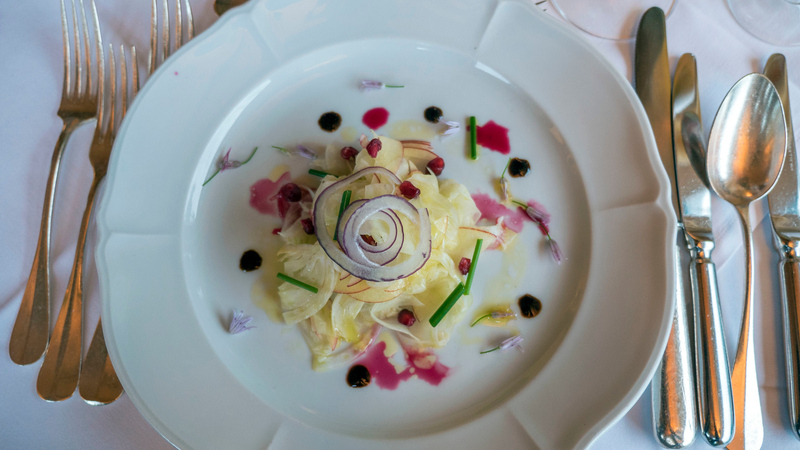 To start, we ate an artfully arranged salad with thinly sliced apples, cabbage, onion, chives, and tiny edible flowers. 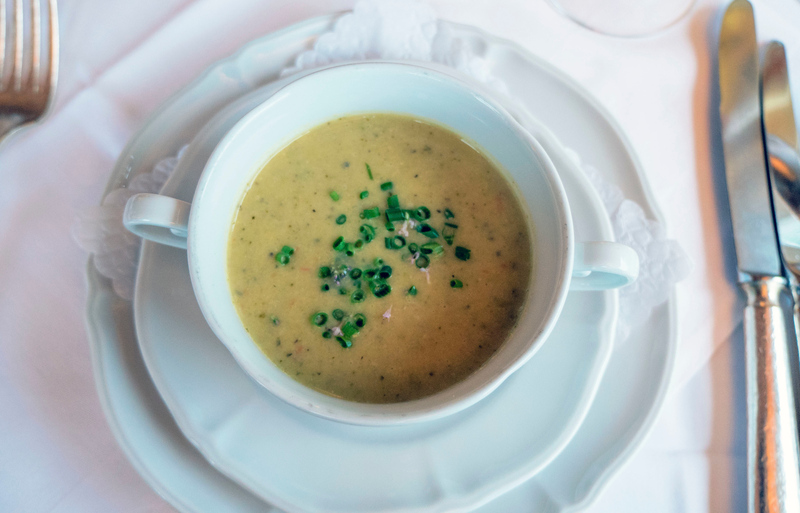 The soup was a creamy potato and broccoli soup with chives and other herbs that was very flavorful. 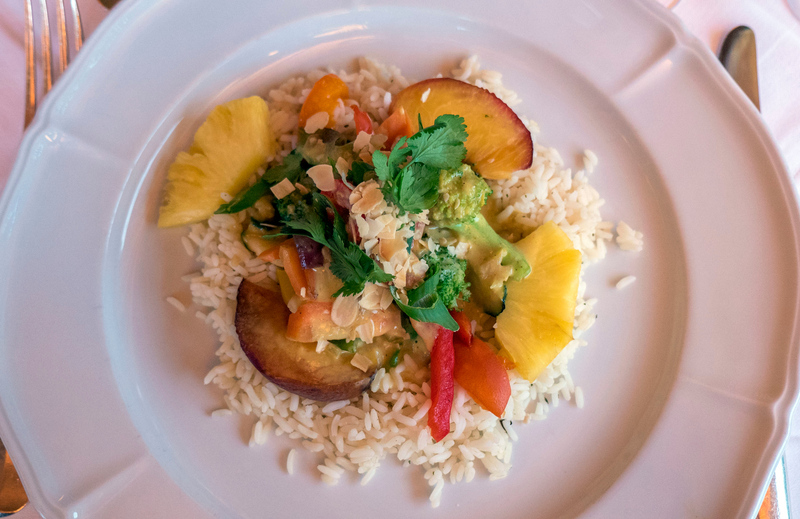 The main course was a Thai rice dish with a coconut curry sauce, including fresh vegetables, fruits, and almond slices. I’ve never had peaches and pineapple in a rice dish before, but the flavors worked perfectly with the sauce. Some of the ingredients used in the restaurant come fresh from the garden of the Hotel Bellevue Wengen. 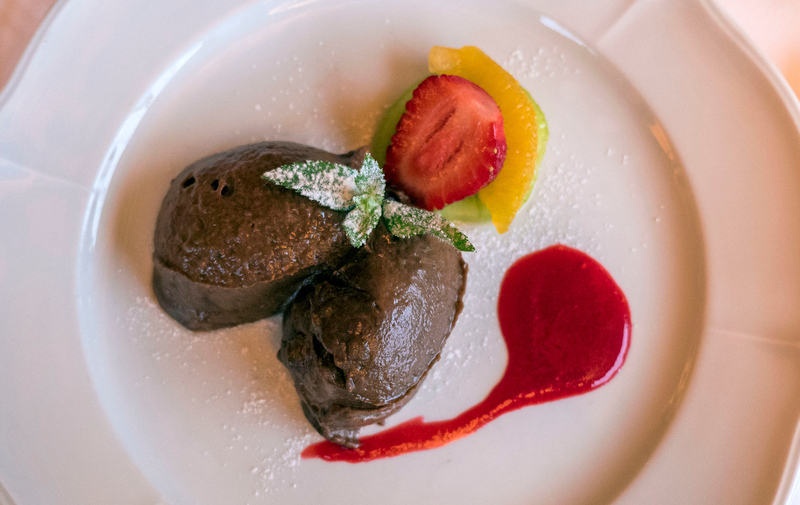 The creative and highly skilled chef found a way to prepare a vegan chocolate mousse for us! We were so delighted to receive a chocolate dessert. It melted in my mouth and definitely curbed the cravings of my sweet tooth. I was amazed that the restaurant figured out a way to make a vegan chocolate dessert for us in a short amount of time. The Hotel Bellevue Wengen is happy to cater to any special diets. 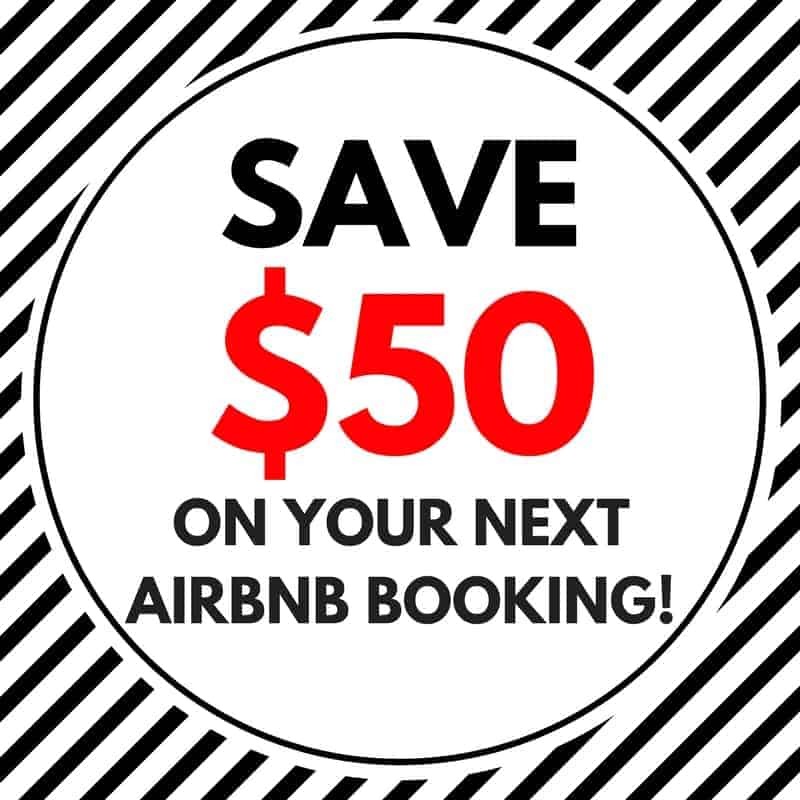 Be sure to mention that you’re vegan, have any food allergies, or follow any particular diet, and they’ll do their best to accommodate your needs. 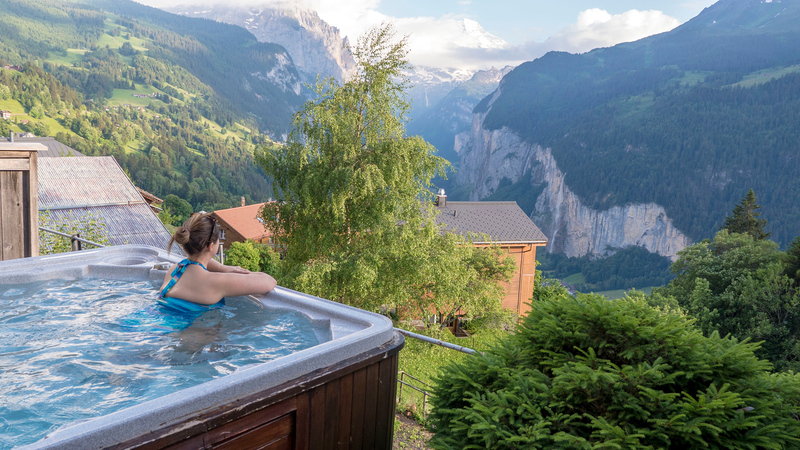 When you stay at the Hotel Bellevue Wengen, you definitely need to spend some time in their outdoor Jacuzzi. It’s shared among all of the guests, but no one else came out to use it while we were outside. 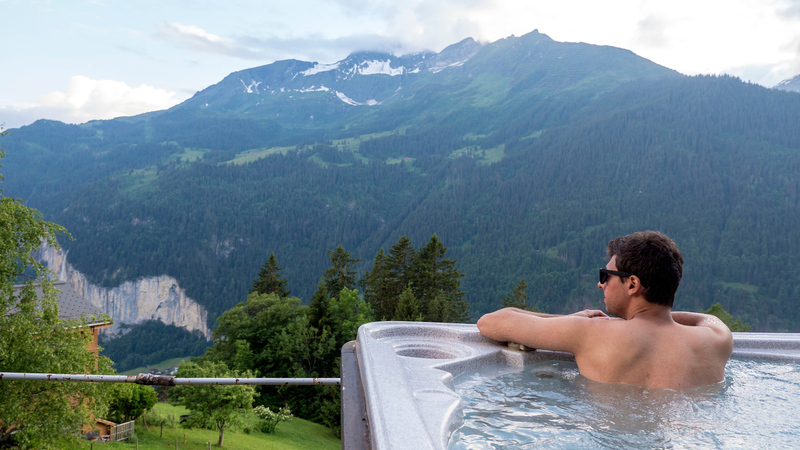 From the hot tub, we had brilliant views of the mountains all around as we soaked in a warm and soothing tub. What could possibly be better than this? 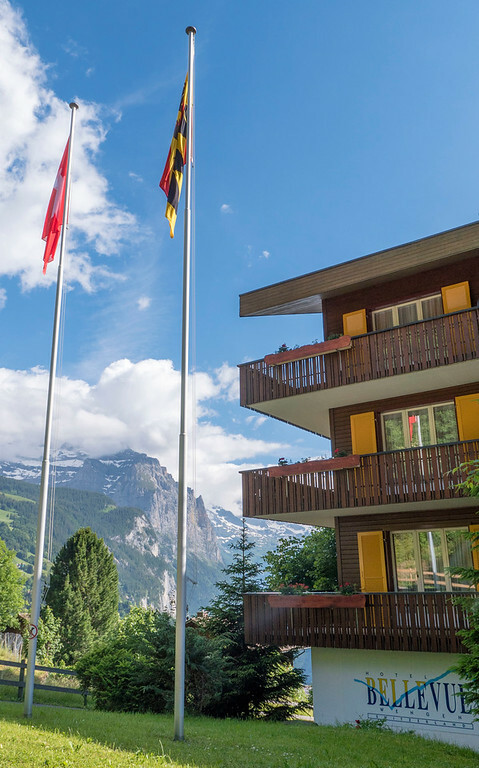 The Hotel Bellevue Wengen is on the far side of town, about a 10 minute walk from the train station. Wengen isn’t that big of a village, so it doesn’t take long to walk from one side to the other. We had no problem managing our suitcases from the train station to the hotel. However, if you’d like to be picked up, they have a small vehicle to transport people and their belongings between the hotel and the train station. 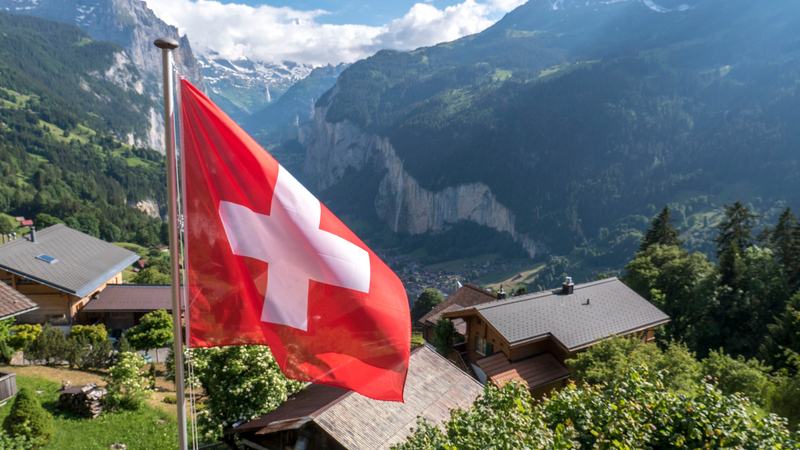 When we were leaving the Hotel Bellevue Wengen, we received a ride with our suitcases to the train station, which made our lives a lot easier. Even though the hotel is farthest from the train station, it is the hotel with the best view. It isn’t far away from anything in town as you can easily walk everywhere within moments. 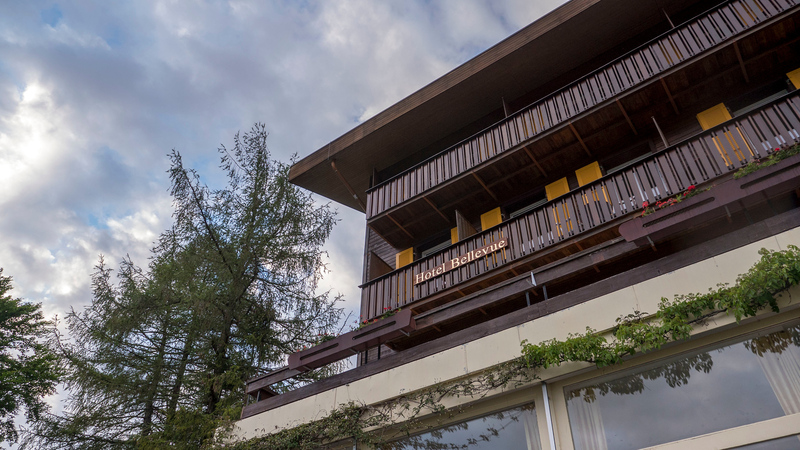 From Judith’s warm hospitality to the absolutely stunning view and delicious meal, we received outstanding service at this amazing accommodation. We chatted with other guests at the hotel who returned year after year, whether it was for the summer weather or ski season. Guests urged us to return during the winter to spend time at the hotel with equally as gorgeous scenery. I’d love to see everything with a dusting of snow, so I am sure we’ll be back in the future! 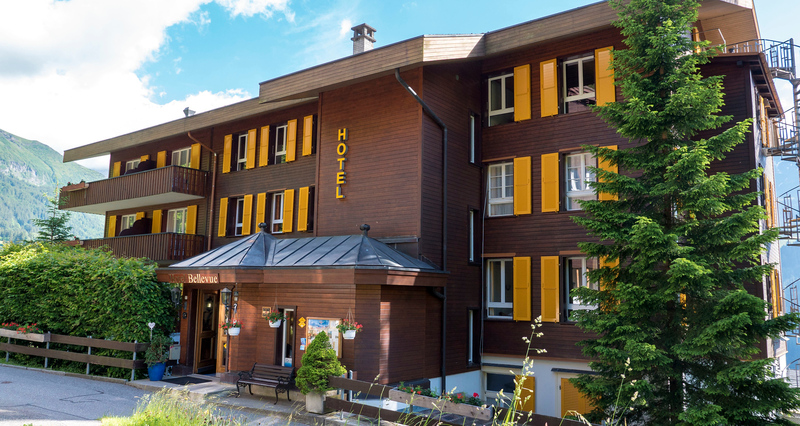 Click here to book your stay at the Hotel Belleview Wengen, and be sure to read more reviews by trusted travellers. PIN this image to Pinterest for future reference. Have you ever stayed at a hotel with a beautiful view? 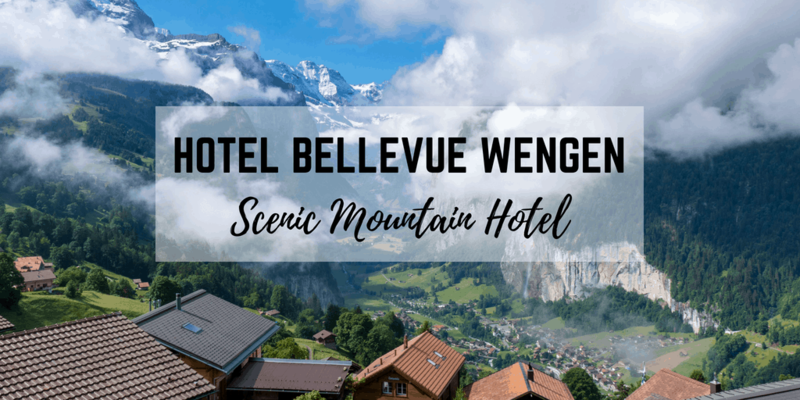 I was first time knowing about the Bellevue hotel ….awesome hotel it was accommodation and the locations are just stunning…this article will be most helpful to the travels guide seriously thanks for sharing this beautiful blog. 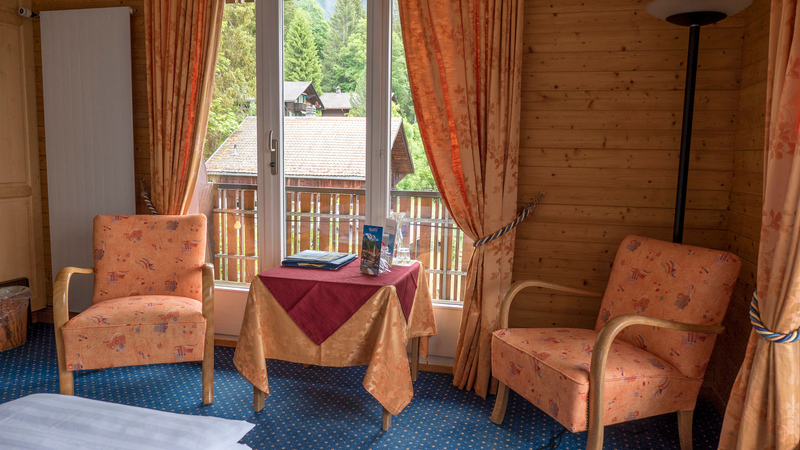 Looks like a restful perch to enjoy Wengen. The food looks incredible and it’s nice to have an outdoor hot tub with a view. Well worth searching out in Switzerland. What a great place, love that it’s been family-run forever. 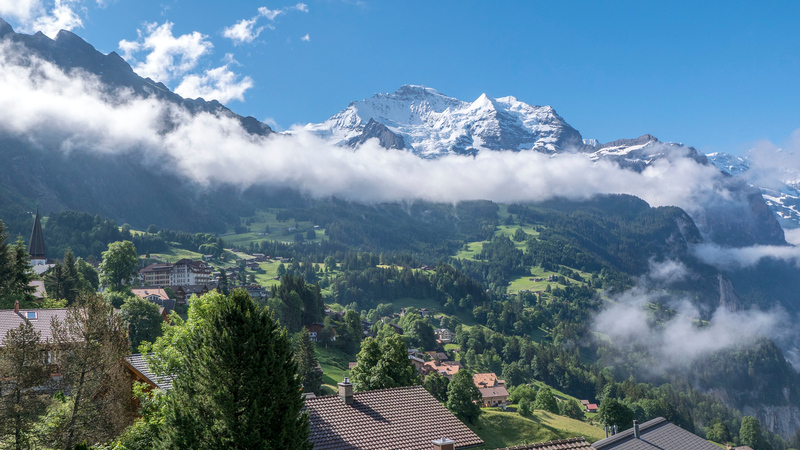 Oh.. and can’t go wrong with Wengen, many fond memories.